This Condo n°192 recently update and clean located in runaway bay resort have one of the best view and position of the location - This redecorated, furnished and clean 2 bedroom, 2bath, ground floor , bay front condo is newly renovated and just with water views from most rooms. 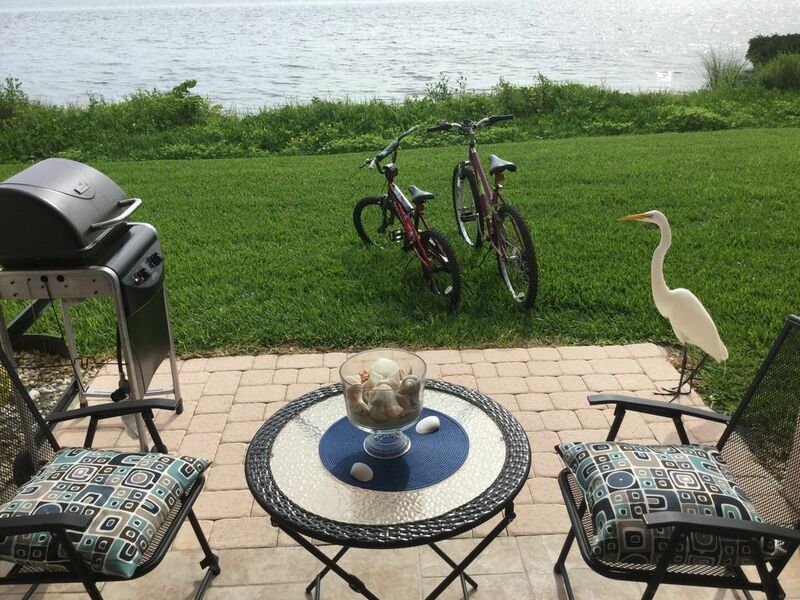 Runaway Bay is a lovely Bradenton beach vacation rental premied resort on the Anna Maria Island and beautiful grounds between the Gulf of Mexico and Sarasota Bay. Our particular Anna Maria Island vacation rental condo was recently totally renovated with new tile floors, new kitchen and baths, in current beach chic. New lcd tv smart tv in all bedroom, wireless internet HI SPEED INCLUSIVE IN THE UNIT WITHOUT EXTRA FEES, BBQ, The bay offers views of boaters, dolphin and numerous tropical birds. We are conveniently located almost halfway between Sarasota and St. Petersburg (roughly 20 minutes to each). The island of Anna Maria fl is unique in having no high-rise buildings and offering an old Florida feel. Yet, you can enjoy some of the areas best restaurants and tropical bars within walking distance of the Anna Maria Island fl vacation rental. In addition, Runaway Bay has a beautiful, large heated swimming pool of the island. FEATURES & AMENITIES: Our Anna Maria Island vacation rental condo offers a spacious 2 bedroom, 2 bath floor plan. There is a king bed in the master bedroom and 2 twins in the other, and now one new queen size sofa bed. A new king size mattress is also available in the unit. Fully furnished in an appealing beach theme, you will have everything you need for a most enjoyable stay. We have cable TV (Flat screen TV in each bedroom and one big in living room), a DVD and CD player/AM,FM radio, wifi router and cable internet, washer/dryer and BBQ in the unit and a lovely lanai on the bay. ACTIVITIES AND ATTRACTION: Runaway Bay is just across the street from a beautiful, sandy beach. The heated pool is the largest on the island with an island feel from the striped umbrellas and chairs. Lighted tennis court, private fishing dock and exercise room. Walk or take the trolley, which stops right in front of Runaway Bay, to the island's many restaurants. Sarasota, St. Petersburg and Tampa are only short drives away. We have compiled a list, which we will gladly furnish for you, of our favorite restaurants, watering holes, beaches and things to see and do in the area. Please i highly recommend to evaluate a trip cancellation insurance for any reason and event. All natural events such as hurricanes, rain, red tide and any other natural event can not be considered the fault of the owner of the apartment. The cancellation insurance costs very little compared to the holiday and can grant a full refund in case of need and give you peace of mind. It will never be possible to accurately predict all events and it is not correct that a homeowner should reimburse the entire holiday to guests who decide to cancel their stay for various reasons. I am 35 Italian owner and i really love this island since 20 years ago. I finally bought my property in 2009 and every year i am spend my holiday here. i am working in italy for Idromec spa / tabarelli spa company in the scrap business but i am often dream my beach house and the with sand just outside the door of the property. Runaway Bay resort is one of the best resort on the Anna Maria island and offers everything you need for a perfect holiday. This resort has one of the best position and easy access for the beautiful white sand beach. The brand-new restorations of my property together the bay view and location on the ground floor complete 360 degrees the best that you could want from a relaxing holiday. The property is located in one of the best locations in the Runaway Bay resort, clean and easy access to the unit make it one of the best choices of this resort. Also, for those who want to work the internet connection is very fast and available at no additional charge. Two more brand new flat screen TV with free wi fi complete the service for lovers of technology. Both bathroom have been full replaced in 2013/2014 with the best quality particolar product. All new tile in the bathrooms are designed in rock style like SPA and make both baths very comfortable and relaxing. Second bathroom has a shower with bathtub and the main bathroom has a new stylist walking shower. Bradenton Beach sandy beach is just a step from the property door. You can walk directly to the beach with your family without car in only 5 minute. The property bay view offer, boater , dolphin, and more tropical bird view. The sandy beach is just cross the street about 0.17 mile from the property entry door. Fitness comunity room are available next the pool. Comunity sauna is available near the comunity pool. There is the biggest, heated and gated comunity pool in runaway bay. Pool chair are free available in pool zone. Please remember your code for open the pool gate. Runaway Bay is a great place to be. Walking distance to the beach, to the bay, to the free trolley stop and to restaurants. On site pool, tennis courts and plenty of walking opportunities. Unit 192 is on the bay side. Views of boats, birds and water!! The unit is furnished with everything I needed. Clean and attractive. Newer appliances. Bathrooms are updated- master has a walk-in shower. I didn't want to leave. But I'll be back!! A nicely furnished, very comfortable, clean apartment with spectacular views over the bay. We could not recommend it more highly. The owner was very attentive to all our needs and has put a lot of thought into the decoration of the apartment. A wonderful holiday, and we would have no hesitation in returning to this apartment for a third time. We stayed about 10 days in this wonderful condo with all the necessary amenities. At the arrival everything loooked clean and tidy. There is an amazing view from the living room and from the owner bedroom of the bay. The house is right next to the water. The owner was very kind: we hard a problem with the sink-grinder and he promptly installed a new one. Even if, in that period, all the area was suffering due to the red tide, we were able to pull it off nicely thanks to the pool, the tennis and the shuffle court. Anna Maria Island is such an amazing place to be. We’ll be back for sure! The condo is very clean and update. You have everything you need for stay. The bay view is amazing and ground floor make everything more easily. The beach is just step from the condo and the runaway complex is really nice. Nice pool and area. The owner is really helpful and try to make you always happy. Really suggested. I will come back. The property is located in runaway bay resort in bay view position. The sandy beach of bradenton beach is cross the street located about 0.17 mile from the property entry door. Is very easy for everyone ( young and old people) going to the beach quickly and by fees. For any special, information etc send to me message. Reservation cancelled 59 days or prior to arrival date will NOT receive a refund unless the unit is re-rented at the same rate & terms 200$ PROCESSING FEE WILL BE CHARGED ON ALL CANCELLATION PRICE AND AVAILABILITY ARE SUBJECT TO CHANGE ALL BOOKING MUST TO BE CONFIRM BY WAGNER REALTY OFFICE IN WRITE UPON THE PAYMENT DAMAGE DEPOSITS WILL BE HANDLED FROM WAGNER REALTY. PLEASE DISPLAY YOUR PARKING PASS IN YOUR CAR - ALL CAR WITHOUT PASS WILL BE REMOVE AT THE GUEST EXPENSE. PLEASE REMEMBER TO REPLACE YOUR PARKING PASS WHEN YOU WILL LEFT THE UNIT.